As a art history student I had to see the vatican museums and the sistine chapel. We headed to the St.Peters place and we were quite shocked about the queuing line. They told us we need to wait about three hours in total. So we decided to get a fast lane ticket which was a little bit expensive - but for me totally worth the price. Whit this ticket we went right into the museum and afterwards directly to the chapel. But we were a bit in a hurry and the museum was unbelievably crowded. A lot of thing were just hidden behind all the visitors and you always had to be careful not to loose the guide. After the tour we spent some time alone in the museum strolling around the less popular rooms and they're so beautiful. All the ceilings were painted with such detailed figures and pattern - we could have spent hours in there. In a next post I'm gonna show you some pictures of the museum - we were even able to get some outfit pictures in there. 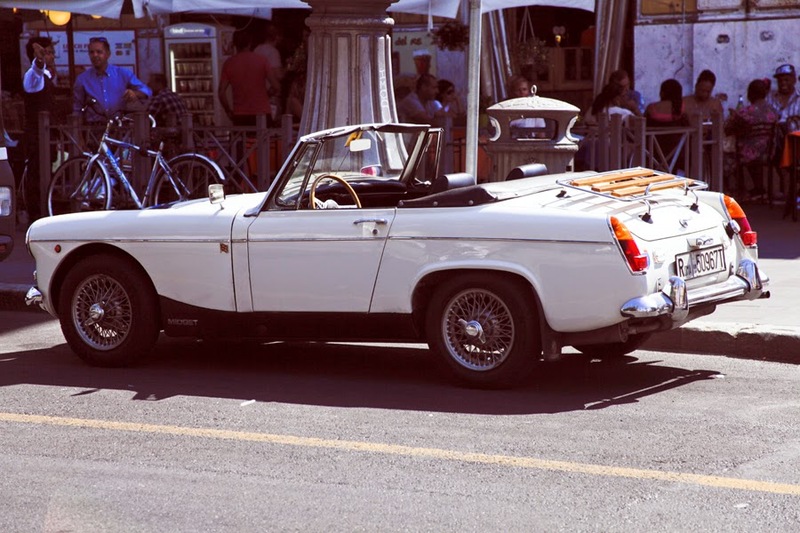 And this beautiful white MG was just standing in a street close by the vatikan - would have loved to just hop in and drive away... If you follow me on instagram @bonsoircherieblog you can discover a picture of me with this beauty. Wow ! What a beauty at St. Peter´s square ! World would not be the world, Rome would cease to be Rome..."